This was Miller's first performance for around a year and may have been the only one with this lineup. its a very good recording , with clean sound, marred only by a few bursts of chatter from the crowd ( probably about maximum 3 minutes in total for whole set ). For 18 months, from 1974 into '76, he would work at his new eight-track home studio, putting together a total of 24 songs that would surface on the band's next two albums. 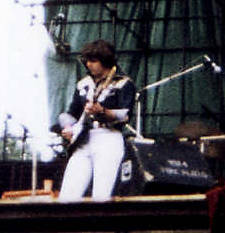 Only one live gig -- an appearance with guitarist Les Dudek from Boz Scaggs' band, former Creedence drummer Doug Clifford, and ex-Miller Band bassist Lonnie Turner at the Knebworth Festival in England -- interrupted his routine; at that event Miller introduced a song, "Rock'n Me," that would soon become one of his most successful singles. I had a very nice first gen recording from the taper of this show, but used this flac version to do this mix as its very clean. (but theres nearly always room for improvement ). The flacs may well have been from my copy, but who knows ? In 2019 I decided to give the flacs a revamp. Originally uploaded to DIME by Homebrew101 on May 1, 2006 - no lineage given. CDR > computer > plex tool professional XL > wav > flac. 2019> audition> >xact SBE to flac.